Temp near 50, Mostly sunny, but overcast by mid-day, and showers by late afternoon, wind NE 15-25 mph increasing to 20-30 by late afternoon. Nothing notable this morning until we got to Contractor’s Camp Marsh and found the Pacific Golden-Plover with the broken leg had at least made it a few miles south. 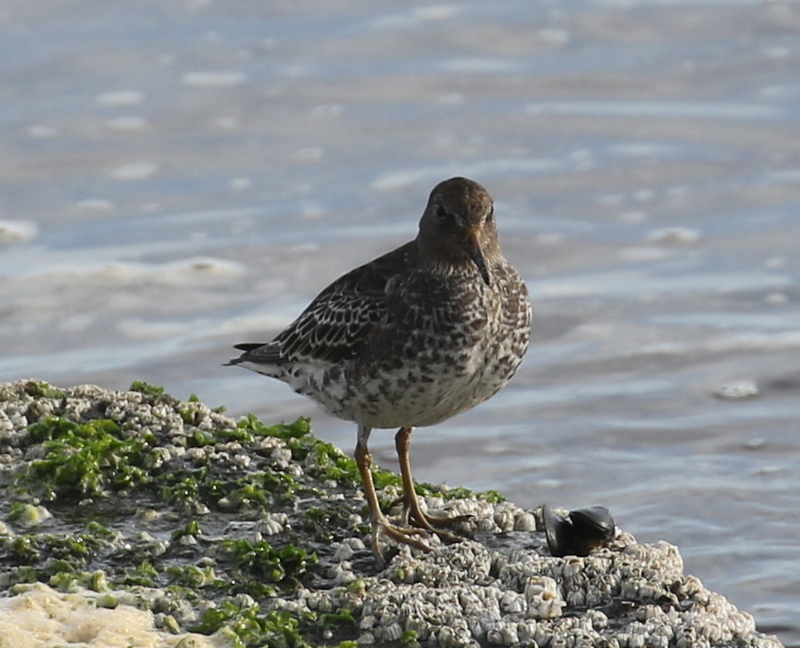 At the Landing Lights Jetty, a flock of 6 Rock Sandpipers put in their first appearance for our trip. At Clam Lagoon, I walked the marsh edge and had a cooperative Sharp-tailed Sandpiper. 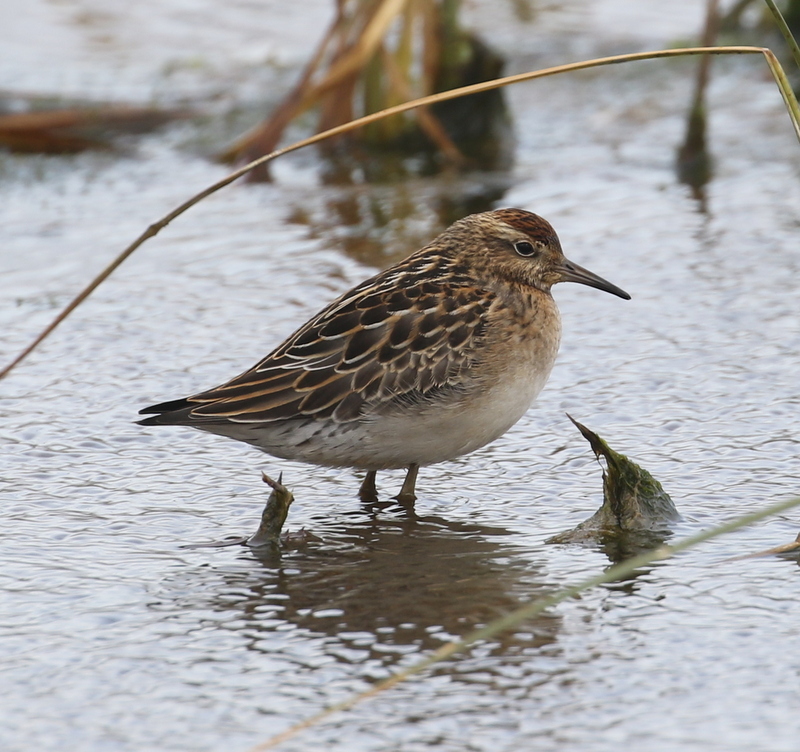 I also had a Pectoral Sandpiper. As I neared the northern end — where Barb was parked — Barb notified me that there were three peeps on the flats ahead of me. They were still too far for photos, so I walked slowly in their direction. A fourth peep joined them. I got distant photos before they flew off. They were three Western Sandpipers and the Little Stint. At the Seawall, we had a Red-necked Grebe and lots of Short-tailed Shearwaters way off shore — no albatross, yet. On the east Side of Clam Lagoon, we saw a flock of 6 medium-sized shorebirds flying. Fortunately, they flew towards us and landed just a short way up the edge, in the lee of the roadside. 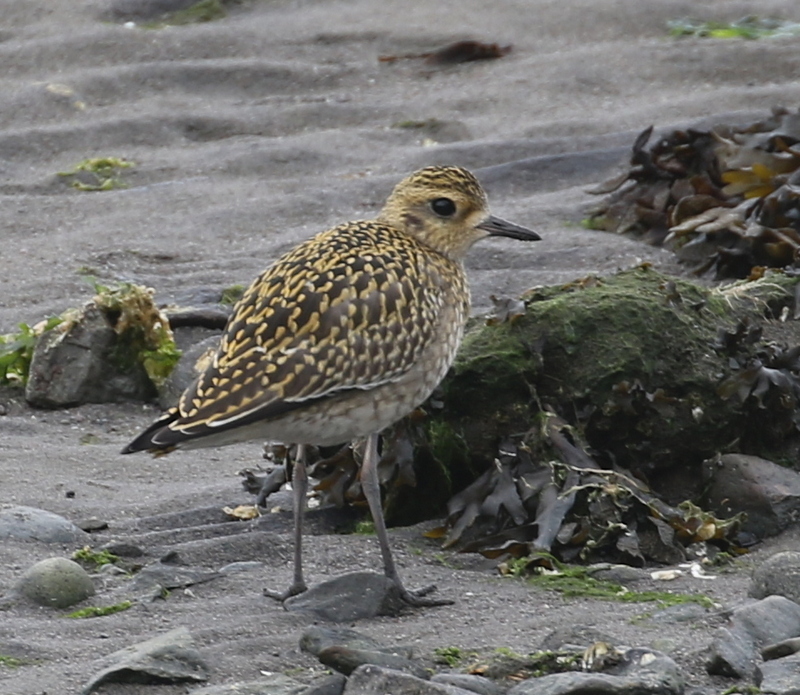 They were Pacific Golden-Plovers — 5 in juvenile plumage and one similar to the broken-legged one we had earlier (but with two good legs). We also saw a flock of about two dozen Sanderlings flying around the lagoon, but wouldn’t put down. After dinner, we went back up to Clam Lagoon to see if anything new was brought in by the changing weather. We had no new birds, but the peeps were back at the same location as earlier — missing one Western. As we were watching them actively feeding, they suddenly stopped, looked alert, and crouched down. A Peregrine sailed by, apparently not noticing them — but they surely saw him! Our trip list is 49, just 5 shy of our average September list.